Hopefully someone sees this in time before these cylinders are destroyed. 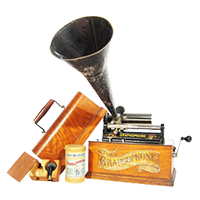 I just found out about a box of brown wax cylinders with slips in the Monticello Antique Marketplace in Portland, Oregon. I have a photo of the pegged box leaning precariously against a wall, showing a number of cylinders already broken. As anyone who knows brown wax, any cylinder has the potential to be of historical importance. I just called the place and the "sales" person I spoke with was not particularly helpful and would not send me photos of the ones that appear to be intact. Price is 200 apparently. I guess they figure the more broken the cylinders the more "authentic and valuable." I am waiting to hear back from the dealer but I care more about seeing this stuff preserved than being first in line. I don't know which booth, so you will have to rely on the photo provided to me. I forwarded this to a Portland collector and he is going to go there today and try to rescue them. Lets hope so! Good to hear, Dan. Let's hope! Well, I had to be in Portland today and was early for an appointment and decided to visit the antique mall with the brown wax. Stan was correct that there were only 3 good ones and a 4th that will likely play. The box is very nice and there are a number of record slips. The lady that owns the stuff happened to be there so I talked to her a bit and got the whole thing for $50. When I get home later I will look closer at what I got. But I think the box is likely worth most of the $50. Sounds like you got a mystery on your hands. Who knows what lurks in these boxes. Hope you find something good in there. I just got home and took some pictures of the box and its contents as I unpacked things. I have not listened to any of the records yet and I have no idea what might actually be on them. But, the pictures will show the 4 fully intact cylinders (not just 3) with the record slips that were associated with them. One of the records had 2 slips so I don't know if any of them are correct. The 5th cylinder is mostly intact and about 2/3rds of it should play OK. The other record slips that were associated with the various broken cylinders are shown as well. I don't really know if what I have is valuable or just run of the mill brown wax (if there is such a thing). An interesting thing that may have proven fatal for 3 of the records. There was some thread (like sewing thread) wrapped around the bottom of 3 of the broken cylinders. One of them was so tight I had trouble getting the remains of the record out of the box. There is a picture that shows the thread I found and at the bottom of the picture of the broken records you can see where the thread was tied around it. A really fun haul. The box is pristine with a wooden base glued into the bottom of the box. The lid is complete and shows now sign of ever having been repaired. Here are a the pictures in the order in which I discovered things. Once I have listened to the playable cylinders I will attempt to match them to their appropriate record slips and report further on them. Click on pictures to enlarge them. Once the picture opens you can click a second time to enlarge it. File comment: All the sad broken pieces. Some are likely repairable if worth doing so. That's a very exciting purchase! It will be fun to find out what you've bought. Ps. There are others out there better than me at repairing cylinders, but I'd be happy to help repair them. got good value for your $50! Please do save all the broken pieces. in the future as specimens for chemical analysis. wax, Ediphone wax, and my brown wax. up that I'd pay their going price for their work. and one which needs to be done somewhere, at some time. Great find! Thanks for going and rescuing those! I plan to keep all the pieces of the broken records. A couple of them would be quite easy to repair (for those with that talent). The others could likely also be put together, but would be cost prohibitive I fear. In any case, none of what I bought will go away while I own them. I plan to listen to the intact records later today. I will report what I find after that.